Ok ... first of all, thank you so much Finatic and Jacob for sharing your masters of the Fuji Rock and Werchter shows ! Your generosity led straight to this dvd which I guess, must have been made by someone before but I've got it hanging on my mind for quite a while now. The Glastonbury set has already been issued here on this blog and from the feedback I got from a tracker, I guess I wasn't the only one who dreamt of it. 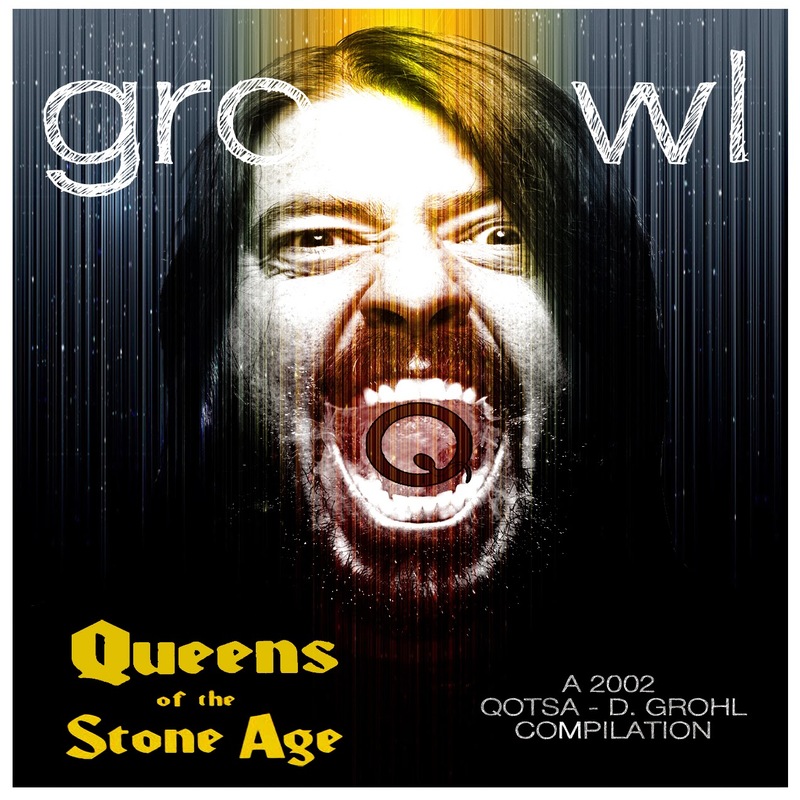 So here they are, the best available highlights of the QOTSA-Dave Grohl era, including the first and the last 2002 shows of rock'n'grohl Dave in the band of his buddy Josh Homme. As often, the Troubadour set is filmed in a dim light atmosphere and I haven't managed to find a better quality footage of the show (if someone has a master, please share it, I'm ready to start it all over !!) 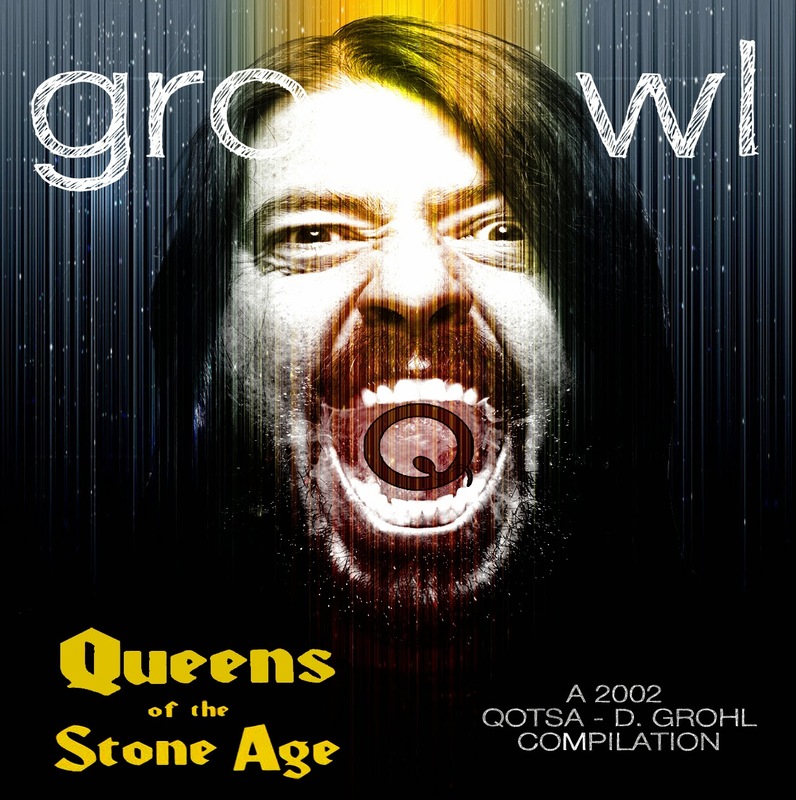 but, it is definitely a heavy high energy one with a Dave Grohl bouncing on his drums from the first beats of "Monsters In The Parasol". The two other highlights are a treat for the eyes since the band is playing in a much clearer atmosphere, right in the daylight of a summer afternoon. The Fuji Rock gig is indeed particular as it is D. Grohl last performance with the band, as he nicely mentioned it in the interview at the end of the video, but also because the band is in a really good shape, with the wild meteorite "Quick And To The Pointless" and the long jam (well over 8 mns !) on "Walking On The Sidewalks", sung by Mark Lanegan ! The Rock Werchter excerpt is great fun too. The interview breaks give an interesting insight of how the band was getting along at the time and it also includes a not so common Spanish version of "Gonna Leave You", sung by Nick. As a bonus, I've added a best-of-both-worlds footage of the last Grammy Awards ceremony, where Dave joined back the newest line-up of the band to play the first single of the last album, "My God Is The Sun". Anyway, it's been quite a long process. Hope it's worth it. Keep up creating all these great dvds, your work is really apreciated. And THANKS A LOT, forgot to thank you. hola excelente pagina. existe la posibilidad que vuelvas a subir los links muertos de este dvd. muchas gracias. saludos desde Chile. Sorry for the slow answer, I haven't noticed your post. Everything has now been updated. Enjoy !